Find Better Ideas, Faster ® with a custom couture fashion trend report, our PRO Dashboard and 80+ categories of premium trend reports. The Couture Fashion Trend Report delves into the styles, brands and lines of haute couture clothing lines for men, women and children. It explores the likes of wellness couture, maternity couture and even luxe sportswear. The report also takes a look at the rise in functional high fashion as well as an interest in it by consumers. Finally, we delve into the oddest materials used in runway shows like 3D-printed materials and even food. The report is a captivating tool to inspire fashion designers, runway programmers and high fashion line developers. It is also a very useful guide for stocking and styling any fashion retail store, whatever its price point may be. It's also a good resource for fashion bloggers and journalists who wish to gain a deeper understanding of top patterns in the couture fashion world. 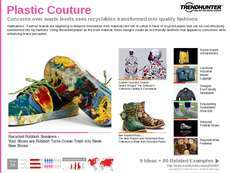 The Couture Fashion Trend Report is a collection of the preferred materials, styles and themes of top couture designers that are gaining media and consumer attention.